**This class is for those who have never taken ACLS before or have an expired ACLS certification card. When a patient is suffering through a cardiac medical crisis, the set of techniques known as Advanced Cardiac Life Support is a crucial tool healthcare professionals must employ to have a chance of saving the imperiled life. It draws on a wide range of technical knowledge and is appropriate only to those who are deeply experienced in patient care. For those who are qualified, however, it can mean the difference between life and death for a person in critical need. As such, it’s often mandatory for advanced medical personnel who will have occasion to treat patients during serious medical emergencies. ACLS assumes access to advanced medical equipment and drugs are only available to licensed professionals. Why Do Healthcare Professionals Need ACLS Certification? ACLS certification provides clinical and treatment guidelines for healthcare professionals. These guidelines have been shown to help sudden cardiac arrest (SCA), stroke and other emergency victims get the best results possible. Furthermore, ACLS certification represents more than just a traditional certification. ACLS training empowers healthcare professionals with preparation for real emergencies that they may face daily. As such, an ACLS class teaches healthcare personnel the skills they need to help reduce the loss of life in a variety of critical scenarios. Professional Instruction: Our instructors currently work in the field and come face to face with the same emergencies that are being taught in class. They can provide real life insight into these situations. Top of the Line Equipment: Our training facilities have real life mega codes rooms where patients can perform and practice all the necessary skills in a comfortable environment. Career Opportunity: With ACLS certification, you can put yourself ahead of the rest of your peers and it can make you more marketable as a candidate. SureFire CPR goes above and beyond to provide first-rate ACLS certification classes every day. By doing so, we ensure healthcare professionals can reap the benefits of ACLS training for an extended period of time. SureFire CPR offers ACLS certification to qualified healthcare providers in the Southern California area, with multiple training locations available. The course is offered in two formats: one that is administered entirely in person at a SureFire CPR office or at your location, and a second format that includes a substantial online portion and then a short skills session at a SureFire CPR office. The blended learning option with the online portion and skills session is designed to accommodate the busy schedules of many of our students. The online portion can be completed at the student’s convenience at their home and then they only need to schedule a short amount of time to come into our office to perform their skills. Our courses are taught by acknowledged experts in ACLS who are currently practicing in their field. Leading small classes of qualified students, instructors guide a participatory approach to learning that encourages hands-on experience in order to fully develop the techniques. Muscle memory is an important function to integrate with our students’ existing skill sets, so adequate resources are always accorded to all students, including a one-to-one manikin-to-student ratio. All equipment students use to practice represents the most current technology. 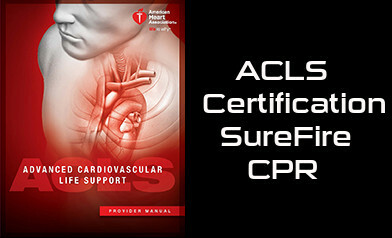 Given the critical importance of the training, SureFire CPR is proud to offer the highest possible caliber ACLS course. We also offer ACLS certification renewal – a shorter version of the ACLS course for students who are currently certified and need to freshen up their skills. We also offer courses that can be taught on site at your home or business to better meet your needs. Contact us with any questions, or to arrange ACLS certification for a large group. SureFire CPR offers a broad array of ACLS class times designed to match or exceed students’ schedules. Explore our course offerings to find out how we can help meet your goals in emergency medical training. At SureFire CPR, we have a simple goal: to teach students how to administer life-saving support in emergencies. To accomplish this goal, we offer ACLS classes and other courses to help our students save lives. Our ACLS classes offer a blend of hands-on and classroom training, ensuring healthcare professionals can gain comprehensive insights. Plus, our classes feature expert instructors who have held roles in the healthcare field. These teachers will provide ample guidance, guaranteeing that students can get the support they need, any time they need it. Ready to sign up for an ACLS class from SureFire CPR? To learn more about our ACLS classes, please call us today at (888) 277-3143.